The verbatim definitions of the 12 different locale codes appear in Graphic 29. Principal City. Principal cities include the largest place (incorporated or unincorporated) and other relatively large places that serve as the primary population and employment centers within a CBSA. Principal cities replaced the older central city term defined by OMB’s 1990 metropolitan area standards, recognizing that many central cities have become much less central (functionally and structurally) within increasingly polynucleated urban areas. Although principal cities are present in both metropolitan and micropolitan statistical areas, CCD City locale classifications are currently limited to principal cities of metropolitan statistical areas only. Rural. 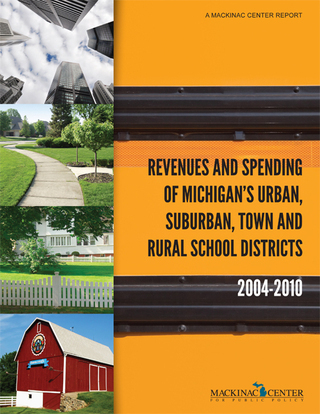 The Census Bureau classifies all population and territory not included in an urbanized area or urban cluster as rural. Urban (urbanized areas and urban clusters). 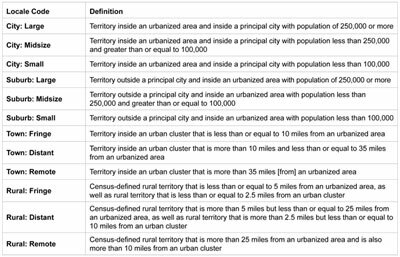 The Census Bureau defines an urban area as a densely settled core of census block groups and census blocks that meet minimum population density requirements, along with adjacent densely settled surrounding census 10 blocks. When a core area contains a population of 50,000 or more, it is classified as an urbanized area (UA). Core areas with population between 2,500 and 50,000 are classified as urban clusters (UC). [*] Phan and Glander, “Documentation to the NCES Common Core of Data Local Education Agency Locale Code File: School Year 2005-06 “(National Center for Education Statistics, 2007), 5, http://nces.ed.gov/ccd/ pdf/al051agen.pdf (accessed Feb. 22, 2011).